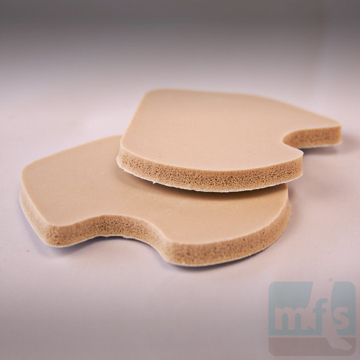 Dancer's Pads - Economy Felt use a unique cut-out design to off-load weight from the great toe joint and sesamoid bones, easing forefoot pain. Adhesive-backed. Right/left specific. By Myfootshop.com. 2/pkg. 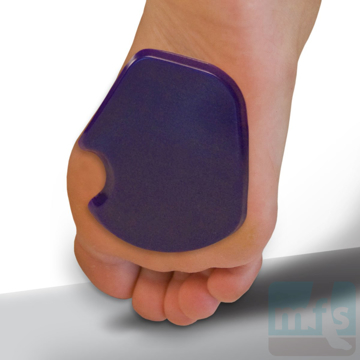 Reusable Gel Dancer's Pads relieve forefoot and ball of foot pain by shifting weight away from the great toe joint and sesamoid bones. Apply directly to the skin. Use with or without shoes. One size, two thicknesses. Right/left specific. By Myfootshop.com. 2/pkg. Dancer's Pads - Premium Foam are soft, adhesive-backed cushions that relieve toe joint and sesamoid pain by off-loading weight from the forefoot and great toe joint. Right/left specific. By Myfootshop.com. 2/pkg.